A safe organic cleaner for stone, wood, glass, polythene, and many other surfaces. With an indefinite shelf-life, it's so easy to use and being non-toxic it’s safe for pets, animals and wildlife. Simply apply with a garden Sprayer, soft broom or paintbrush and leave it to work. there’s no need to scrub or rinse it off later and the effects really do last. With an indefinite self-life, our 20 litre drum offers extra value. All the advantages of our smaller 2½ litre bottle, but offers a 15% saving compared to buying the equivalent smaller bottles. When the drum is placed on it's side, the reusable tap makes dispensing easier, as a 20 litre drum will weigh approx 20kg. Simply screw the tap in place of the cap and re-use on subsequent drums. 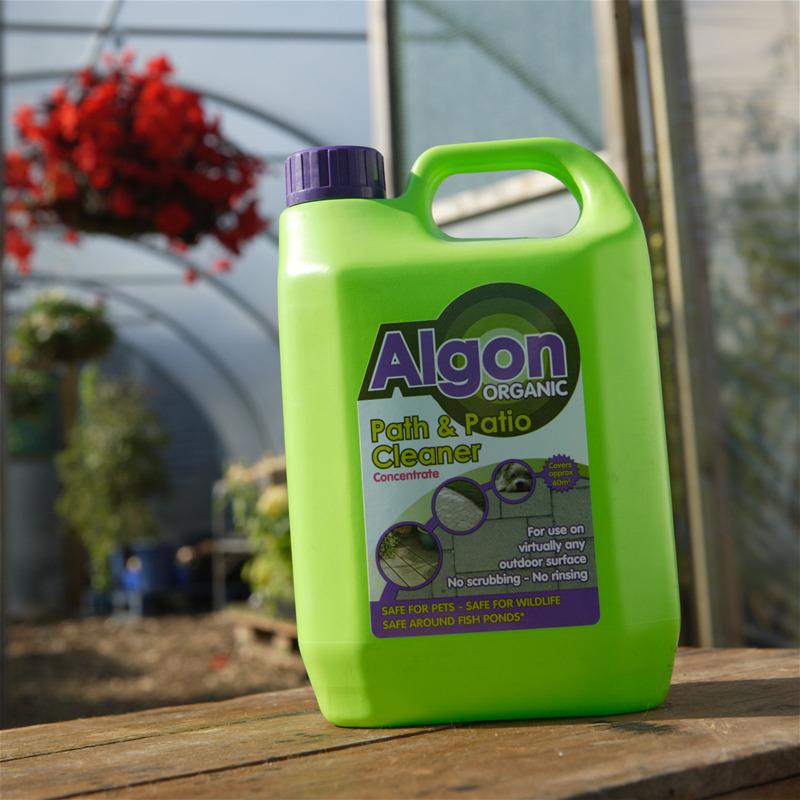 2½ litre concentrate makes up to 10 litres - 2½ litre container cleans approximately 60 square metres and will typically clean a 12ft x 30ft Polytunnel. 20 litre concentrate makes up to 80 litres - 20 litre container cleans approximately 480 square metres and will typically clean 2 lots of 20ft x 78ft Polytunnels. Rated 4.9 out of 5 based on 22 reviews. Reduces Algee on tunnel cover. One application using a fine handspray cleared 90+% of the green algae on the polytunnel. The tips of the garlics, which had grown a couple of inches, were affected but, hopefully, will grow through. Next time I shall ensure anything growing is properly covered. It leaves quite a strong smell after use and the polytunnel needs airing. A bit difficult to rate Algon yet as have been unable to use it but polytunnel beware when weather improves! The tap makes it easy to use the 20 litre bottle but rather expensive for a one off use, but I was looking to use the drum for water storage later and this tap will prove very useful. This is magic stuff, smells of fish and chips, and a quick google suggests this is acetic acid - vinegar, hence the organic statement. Cheaper than buying white vinegar and a much stronger strength. Really works and seems to keep on working. We need this badly and hopefully will be hassle free to use! Just what the driveway needed. Ease of use as barrel would be heavy to lift. This stuff is AMAZING! If you think recovering is your only option then try this first...and if you own a poly tunnel use this stuff!!! Why would you not...Algon certainly will prolong the time to recovering? My green looking tunnel is bright white in 3 days!!! Did what it said on the tin! Cleared the mould off my polytunnel in no time. Thanks First Tunnels for delivering this Algon algae remover to us promptly. We haven't used it yet, we are waiting for the right weather, so I can't comment on the performance. Wow, this does really work, Used a watering can to cover my paths and within a week the green scum has totally gone. Not sure how long the effect will last but 5 stars from me.